Offering stunning views of Montreal, the Observation Deck Place Ville Marie enables visitors to discover a new and unique view of the city’s main landmarks and cultural pillars. Located downtown and at 185 meters above ground, the Observation Deck Place Ville Marie also offers an innovative exhibition that immerses visitors into a multimedia experience of Montrealers’ daily rituals. Furthermore, the venue houses the most elevated dining destination in the city with authentic Montreal cuisine by les Enfants Terribles Brasserie. The Observation Deck Place Ville Marie certainly is the best place to see all of Montreal from the top! With mobile tickets, simply scan your phone for direct entry. Enjoy Montreal with 360° views. 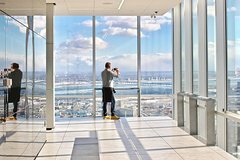 Located in the heart of downtown, the all-glass Observation Deck Place Ville Marie offers the best view of Montreal. From the top of the iconic building with the rotating beacon, you can see the city's scenic beauty from the St. Lawrence River and Mount Royal to the Quartier des spectacles, the Olympic Park and Jacques Cartier bridge. Amidst its sleek decor, the 46th floor houses the Odyssey gallery, which retells the history of Place Ville Marie and its political, economic, and architectural heritage through large sized images . There are also 12 information boards, developed in cooperation with Heritage Montreal, that highlight Greater Montreal's human and natural heritage. In addition, download our free audio-guides that will lead your visit at the Observatoire through different themes. Find the icon upon your arrival at the 46th floor, as a starting point for your visit. Let yourself be guided through our narrators’ voice and have a brand new look at the city.